I am a working mom of 3 children: ages 7, 15, and 19. I am married to my best friend and we enjoy going to sporting events, travelling, and hanging out with our family and friends. I have worked for the same department in Illinois since 1991 and find my career very rewarding and exciting. I have been digiscrapping since January 2008 when I received PSE6 as a Christmas gift. Since that time I have purchased PS CS5 which I am sloooowly learning how to use! I enjoy offering freebies on my blog and have spent most of my spare time designing rather than scrapping! Have just discovered actions and LOVE using them. Thank you for being so generous with your creations they are great! "Hi Deb, you've received an award on my blog, please visit me there and pick it up hun." When I saw that your hubby took flight lessons in St. Charles, I had to see just how close we were. While we aren't exactly neighbors, I'm not that that far away - just NW of you in Freeport. I grew up in Chi town and went to school in Dekalb. Ex was born and raised in Morris so I spent some time in your area. Small world! Thanks for all the goodies you give. I think I spend more time collecting than doing anything with them! I'm a PSP user, so we do come from slightly different backgrounds. Take care and best wishes for a wonderful New Year for you and your family. Love the tool kit! We currently have a couple home improvement projects going that these will be perfect for. Thanks for creating and sharing your creations. Maybe I'll pass you by on one of our frequent trips through IL (our 'home' state) - have to call Ohio home right now. Just found your site and very impressed with your work. You either have graphical ability or not, you sure do have it !. Hi I have become an addict to digital in just a few weeks. Found your blog last night...u r an amazing designer. Am a mom of a 12 yr boy, own 2 cats ( or they own me, am not sure) avid reader and scrapbooker and am a lawyer. many best wishes from San Juan, Puerto Rico. Thank you for your freebies!!! Thanks for the post. I have a heart for Cops, my grandfather is retired from the police. Thanks for sharing your hard work and God Bless. I just discovered your blog. I have been online at least an hour, enjoying all your comments (and your freebies). I wanted to thank you for sharing so much. I know it's hard sometimes to share with no thank you, so. HERE'S SOME LOVE AND THANK YOU FROM TEXAS. HI. Loving the blog. I saw you mention Facebook-but I dont see anywhere to be a fan, add you to friends, or any other way to visit you. Did I miss something? I am so excited to have found your blog! In my search for a lily element, Stacey from Scrap That Idea gave me a link to your flower set #3. Very cool! I like the lily, have been playing with it in an attempt to get just the right color pink for my sister's wedding invitation. Thank you! A dear friend & I have a website, www.pagestotreasure.com. We print digital scrapbook pages at affordable prices on high-quality paper. We would love to print some free layouts for you in order to show you the quality of our prodcut! And then, maybe, discuss ways we can promote each other's sites. We are always glad to find unique places to share with our customers! Thank you so much for sharing your talents with the digital scrapping world. Love your work! Also, a special thanks to you for your job as a Police Officer. We could not be safe in this world without you having our backs. I come from a long line of officers and appreciate your sacrific. Be safe and God be with you at all times. First off, let me send you about a hundred "Thank Yous" because I think that's about how many times I've dowloaded your stuff. You've really sparked my interest in getting more into digital scrapping. I had PSE 4 and 5 and never really got that into it. Now DH bought me PSE 8 for my birthday earlier this month and I am getting a Bamboo tablet for Mother's Day. Now if my 15 month old twins would let me scrap! Anyway, the main reason I am writing is to pass along this blog (http://collectionaday2010.blogspot.com) that SO reminded me of you--probably because of your extracted photographs of vintage items. The blog is featured in the May Martha Stewart Lining at p. 42. Hope you find it interesting. I know they say you get what you pay for. I guess they never visited your site. I am in the process of learning how to be a better "Digi-Scrapper" at Hummies World. With the quality of education offered and the easy approach to the subject matter, she has made me a lot better at scrapping. Now I have found your site to assist me with your wonderful downloads that are unbelievably FREE. TY for all you do for us in the digi-scrapping world. Keep up the good work. Rodfather at Hummies World. I just wanted to say thank you so much for all you do. I am very thankful for people like you who are willing to give away their hard work to those of us who love to scrap but can't afford all the fancy products. I don't think that 20 dollars is too much for the commercial use of your stuff. Your quality is top notch and you should be very proud of what you have accomplished. I will be an avid follower now!!! Thanks so much for all your great freebies! I've re-discovered your site a time or two as my digi-scrapping skills have grown and am really excited about the items I downloaded today. I used your star clip and notebook paper shapes on this layout of my son tonight! Just found your great site. Love all your designs especially the doodles. Have downloaded a bunch of stuff and can't wait to try it out. Have not been digiscrapping too long. Am a grandmother of seven, so I have plenty of pages to do. Keep up the good work. I've just discovered your site and love most of your creations. I'm learning to use the PSPPX4 to do my digital scrapbooking; still a novice but hoping to improve! Will keep an eye on your site! Thank you for all the great stuff!!! 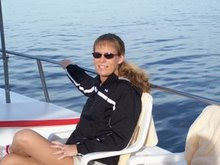 LEONA in Florida,a transplant from Michigan. My gosh -I think I've just died and gone to heaven. Don't know how I came to stumble on The Scrappin Cop but so glad I did. Kiddo you are good! And not just technically but very creative - I'm having so much fun looking through all your posts. I'll probably be getting your commercial license soon - a fantastic bargin! You go girl!!! Hello! I found your blog through your Key Shapes custom shapes listing under Deviantart's Photoshop Resources listing. I signed up for 4shared so as to download your lovely files. Your readme file however has some terms/acronyms I do not know. What do SFO/SFH and CU mean? I am new to all of this and I've never seen these terms before. Thank you! Hello, I have been out of the scrapping world for a little while. You changed your TOU since I was last scrapping on a "full time" (if you can call it that) basis. 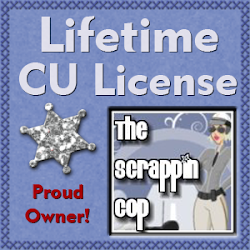 I was interested in purchasing a Lifetime CU License so that all the stuff I have from way back I can use without worry, and continue to download new items without worry also. Is this the same as the Unlimited? TY in advance for your help, and TY for all you give and do!! I'm just outside of Chicago near O'Hare airport. Found you via the lovely Scrappienss Downunder. Talk about going the Long way around! Just wanted to say thank you for the lovely freebies. I get so busy as a graphic designer that I often don't have time to design alot of my own elements for my scrapping, so lovely people like you really help me out! hi there i am a new tagger- and i have photoshop- thank you for sharing your cu free items - i can really use them when i go and make my tags.